Some tropical tarantulas have made the move from the ground to shrubs and trees. There they spin thick, unsightly webs over tree holes in which they spend the day. The web­bing helps them maintain the proper relative humidity and temperature for life. Consider the problems of living in a tree: wind drives down the humidity, sunlight bakes you, and a tree hole can never provide as much insulation as a burrow in the ground can. 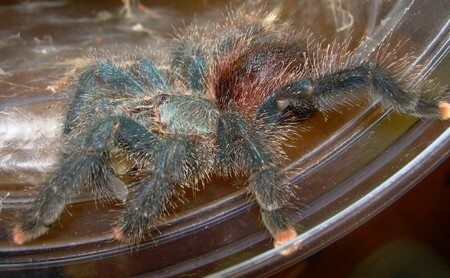 Yet tarantulas from both the New World (Avicularia spp. and Psalmopoeus spp.) andOld World(Stromatopelma spp. and Poecilotheria spp.) have made the transition successfully. 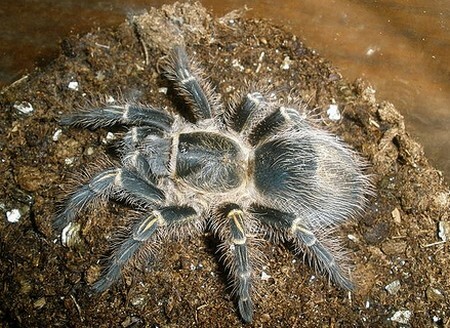 Not surprisingly, perhaps, most tree-dwelling tarantulas live quite well in a normal vermiculite-based terrarium. They tend to spend most of their time near the top and cover the sides with so much webbing that owners seldom see them, but they will feed and even breed in these cir­cumstances. Advanced keepers, however, want to give their tree-dwellers a more natural-looking setup, so they tend to use high, narrow cages (often just 6 inches [15.2 cm] square at the base and 12 to 16 inches [30.5 to40.6 cm] high) that contain a real or artificial branch, often with a small retreat hole, on which the spiders can attach their webbing. Many hobbyists specializing in tree-dwellers like to build their own cages of glass and plastic, but some find that turning a 20-gallon (75.6-L) aquarium on its side and building a secure cover for the now-vertical front works well for larger species. Some even house young tree-dwellers in the plastic boxes designed to hold Beanie Babies and similar stuffed toys—these boxes are roughly 4 inches square (10 cmsquare) and about 8 inches (20 cm) long. The cage for a tree-dweller, regardless of species, usually includes a layer of damp vermiculite in its base to supply needed humidity (in addition to daily misting). Tree-dwellers are adapted to live at a somewhat lower relative humidity level than terrestrial tarantulas are, and most will tolerate 50 percent humidity within their web retreats. Remember that humidity is measured within the retreat, not at the center of the cage. Though some can withstand quite warm temperatures and bright lights, most tarantulas are best kept in low tight levels and at normal room temperatures, much as you would keep a red-knee or king baboon. These species may be tough, but they still are tarantulas. Make sure the branch used as the center point of the ter­rarium is clean. Many branches you just pick up in the yard contain ant colonies that can devastate a tarantula colony. Colony, that reminds me of one other difference between tree-dwellers and terrestrials. Some tree-dwellers live quite well together as long as they are of similar size, are well fed, and have a multitude of suitable retreats present so there is no fighting. There still is a risk of losing a molting tree-dwelling tarantula to its cagemate, but the risk is not as great as with terrestrials. Consider colony arrangements, but also consider the risks.